The Blackhawks are champions again! How crazy was that? Both goalies were pulled at some point in the final minutes. The Blackhawks, down 1-0 scored two goals in 17 seconds, take the lead and fend off the Bruins to win the Stanley Cup for the second time in four years. 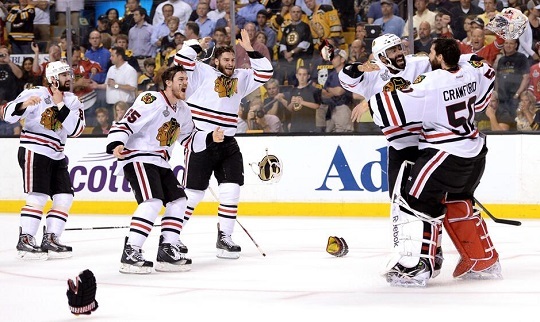 This was one of the best Stanley Cup Playoffs I’ve seen in a long time. And to end it with a great final series where we see this kind of ending, amazing! The first game went into three overtimes. We’ve had outstanding play from both sides and the aura of the Original Six truly made this series a great one. With the realignment, we have a lesser chance of an Original Six matchup again. I’m going to cherish this series. Despite my team not being in it, this was the kind of run throughout the entire playoffs that really made hockey big again in America. And maybe, the game gained some new fans from this. Lockout or no lockout, we had a fun season. This entry was posted in Boston Bruins, Chicago Blackhawks, NHL, Playoffs and tagged Stanley Cup Playoffs 2013. Bookmark the permalink.